Feed the Fun Contest - Win up to $10,000! Home » Contests » Feed the Fun Contest – Win up to $10,000! Feed the Fun Contest – Win up to $10,000! 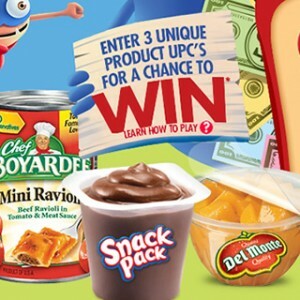 Enter the Snack Pack, Chef Boyardee and Del Monte Feed the Fun contest for your chance to win up to $10,000! $1,000 Prize – Enter any one UPC code from the above participating products to be entered for a chance to win this prize. $3,000 Prize – Enter any two unique UPC codes from the above participating products to be entered for a chance to win this prize. $10,000 Prize – Enter any three unique UPC codes from the above participating products to be entered for a chance to win* this prize. Jamieson Contest: Flip the Lid & You could Win a Million and more! Win a $500 Hudson’s Bay Gift Card from ShopStyle!